An inscription on the stretcher tells us that Trego painted this work for his cousin, Mary Trego Hillborn. It was very likely down at her request and may represent individuals of her acquaintance. 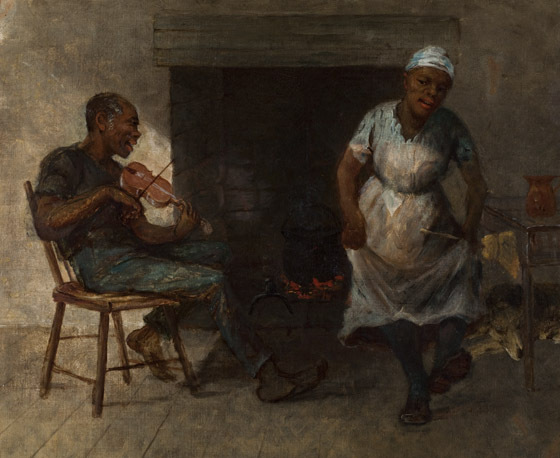 When compared with portrayals of African-Americans by some of his contemporaries—Thomas Hovenden’s several portraits of his neighbor, Samuel Jones, for instance—Trego’s Black Musician seems more playful and light hearted. Trego painted this for his cousin, Mary Trego Hillborn. It passed to her granddaughter, Patricia Carleton, who eventually consigned it to Samuel Freeman’s auction in Philadelphia, June 2006. It was purchased at Freeman’s by the current owners. The painting was cleaned by the Gratz Gallery and Conservation Studio in 2011 and is in good condition.